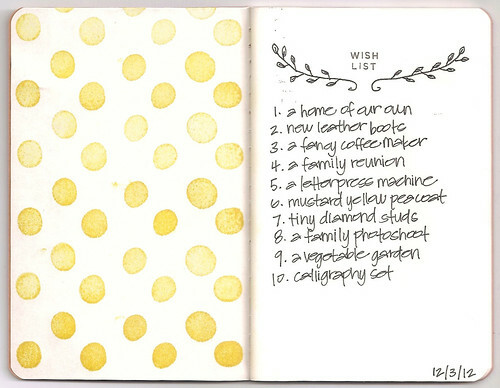 For the Book of Lists project, this month's theme is "wish list". I wasn't sure where exactly I wanted to go with my list, but as I sat down to write it I decided to just jot down the first ten things that popped into my head. They ended up being things that have been floating around my mind for a while now, so I suppose it's fitting! View the cover of my book here! If you'd like to join the Book of Lists project, please do! It's easy peasy. And rather fun. Find all the information over on Kathleen's blog: Kapachino. That's a really cute idea! I look forward to see the months to come! I wish my handwriting was as pretty as yours!